Bhagalpur city of Bihar has the unique distinction of being the world's largest ''Rescue and Rehabilitation Area for Garuda'' which is according to Indian mythology, is the vahana or carrier of the god Vishnu. The mythical Garuda is staging a comeback. More than four years ago, it was an endangered bird listed under Schedule IV of the Indian Wildlife (Protection) Act, 1972. After continuous rehabilitation program, the birds, belonging to the stork family, have staged a come back and started nesting and breeding in Bhagalpur district. Now their number has gone up to a comfortable level. In the recent past it has increased manifold - over times from 78 to over 500. It is said its world-wide population is just 1200-1300. Places they are found in are in Cambodia and the other two are in Assam and Bihar, India. In the former, the garuda population is about 150; in Assam it is about 650, and in the Bhagalpur district (close to Kadwa Diyara or Naugachia) the garuda population is about 500. The Garuda population plummeted to a low level in the late 2000s due to loss of nesting habitat and feeding sites primarily caused by drainage and pollution coupled with collection of eggs, hunting and lack of public interest. The garuda birds were rarely spotted in Bihar during breeding period after the loss of their habitat. The garuda, biologically known as greater adjutant Leptoptilos dubius, breeds during winter in colonies that may include other large waterbirds such as the spot-billed pelican.This huge stork has a naked pink head, a very thick yellow bill and a low-hanging neck pouch. The neck ruff is white. The bird looks like a vulture. 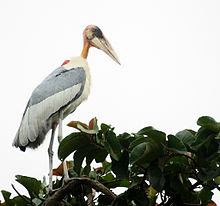 Other than the pale grey edge on each wing, the rest of the greater adjutant's body is dark grey. A Garuda bird measures 145–150 cm (about three feet) in length and four to five feet in height. 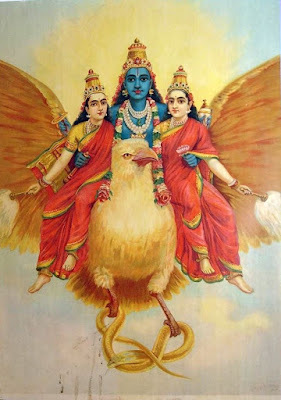 The Garuda, a legendary bird or bird-like creature in Hindu, Buddhist and Jain mythology, is the vehicle /mount (vahana) of the Hindu god Vishnu, a Trinity God in charge of protection and sustaining life and Astasena in Buddhism, and the Yaksha of the Jain Tirthankara Shantinatha. In Hinduism, it is a divine eagle-like sun bird and the king of birds. In Rigveda Garuda is described as celestial deva with wings, whereas the Yajurveda text (Shatapatha Brahmana) mentions Garuda as the personification of courage. Considered as the king of birds, Garuda is actually kite-like bird often shown in the mythology as either in zoomorphic form (giant bird with partially open wings) or an anthropomorphic form (man with wings and some bird features). He is believed to be a powerful creature in the epics, whose wing flapping can stop the spinning of heaven, earth and hell. It is believed to be a protector with power and agility to fly over to anywhere. Ever watchful and swift in action he is an enemy of the serpent, hence he is known as Tarkshya and Vynateya. In the Puranas, Garuda is ever associated and inseparable from God Vishnu. He is an integral part of Vaishnavite mythology. It is quite interesting to note that Garuda is a part of state insignia in India, Myanmar, Thailand, Cambodia and Indonesia. 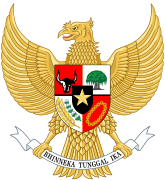 The Indonesian official coat of arms is focused on the Garuda and the national emblem of Indonesia is called Garuda Pancasila. The Indian Air Force also uses the Garuda in their coat of arms and even named their special operations unit after it as Garud Commando Force. 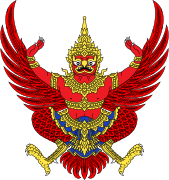 In Thailand's Garuda appears as a more traditional anthropomorphic form, while in Indonesia as a heraldic style with traits similar to the real Javan hawk-eagle. The Hindu texts on The Garuda iconography is quite interesting and the details may vary. In the bird form, he almost resembles an eagle (sharp nose, beak or legs, his eyes wide open and big, his body the color of emerald, his golden-yellow wings spread widely as if he he is ready to take off in any direction. He is also depicted as having either two or four hands. When he is carrying Vishu on him he holds a pot of Amrita (nectar of immortality ) in one hand in the rear and an umbrella in the other, while the front pair of hands are held in supplication in (anjali) posture. His rear rhands provide the support for Vishnu's feet. In some forms of Garuda iconography, he also carries consorts of God Vishnu (Lakshmi and Bhumi Devi with the lord. 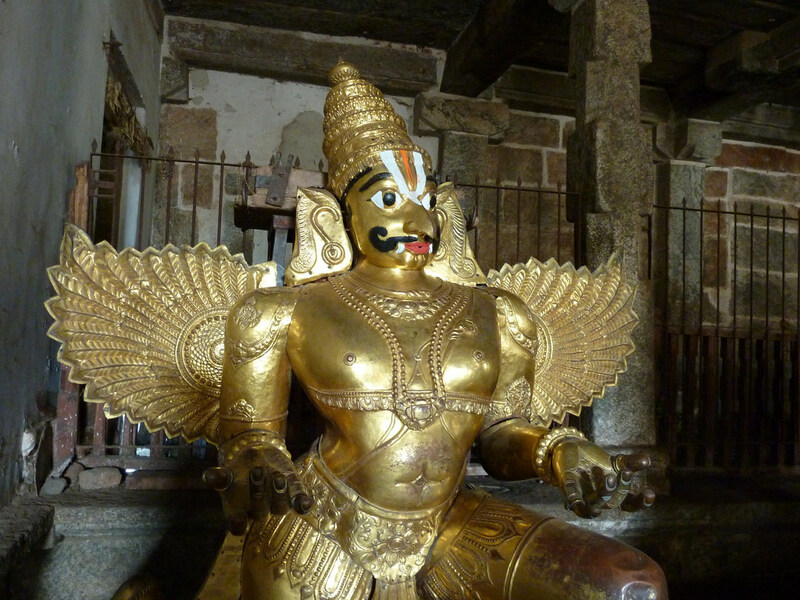 There are countless temples in south India, where you can see various forms of Garuda iconography. One of the earliest temple is the Badami cave temple of Karnataka and it is on the underside of the eave at Cave 3 entrance (6th-century). God Vishnu, the protector and preserver of Dharma, has made Garuda'an iconic symbol of king's duty and power, an insignia of royalty or dharma. 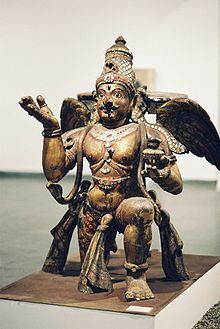 His eagle-like form is shown either alone or with Vishnu, signifying divine approval of the power of the state. The early Hindu kingdom had minted coins with Graruda's face, showing either as a single headed bird or a three-headed bird that watches all sides, symbolic of guarding the kingdom. 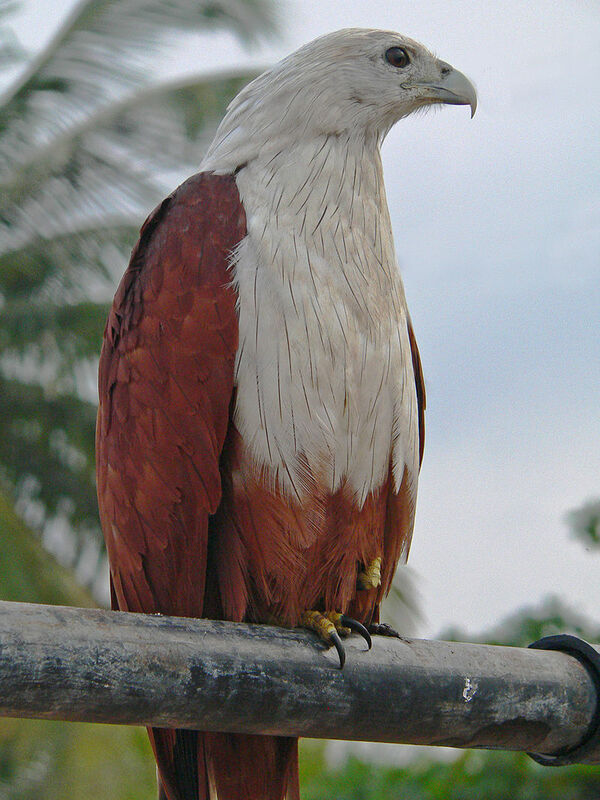 In Thailand's Garuda appears as a more traditional anthropomorphic form, while in Indonesia as a heraldic style with traits similar to the real Javan hawk-eagle. In the Indian Air Fprce, Garuda Commando Force is a Special Forces unit specializing in operations deep behind enemy lines. Brigade of the Guards of the Indian Army uses Garuda as their symbol. The mythology of Garuda cuts across many countries in SE Asia.